MetaVis Platform includes a neat feature that allows users to download SharePoint content to the file system. The function saves items metadata (field values) to Excel/CSV spreadsheet and downloads content and attachments to regular files on the file system. The function uses special file naming convention when instructed to download versions but otherwise documents are openly available to use and located in similar folders they were located in SharePoint. The function could be used to archive inactive projects, transfer project data in bulk to another location or free up space in SharePoint content database by offloading chunk of the content. Offloading function could be done for selected folders or individual items, lists, sites or complete site collections with sub-site hierarchies. Offloaded data could be loaded back to SharePoint using the same MetaVis Platform. The offloading function works remotely without server side agents and could be used for on-premises, hosted or Office 365 SharePoint starting with version 2003. The function is available in MetaVis Migrator for SharePoint as well as MetaVis Backup for SharePoint. File Classification Infrastructure (FCI) is a part of Windows File System Resource Manager available on Windows Server 2008 R2 that allows managing and tagging files on the file system with custom metadata. Tagging files on the file system and making the tags available for browsing and for search provides a great alternative to full scale content management systems like SharePoint. The tagging in FCI becomes even more useful because administrators could define the set of custom properties, their data types like string or boolean and even potential values for users to select from. We at MetaVis Technologies realized that it will be interesting to implement a robust integration solution that will connect files managed by FCI with SharePoint libraries. With such a solution the files managed by FCI will not be locked in FCI but could be reused by company portals and workflows along with the same metadata collected by users on the file system using familiar Windows Explorer interface. FCI use starts with File Server Resource Manager Classification Management area. 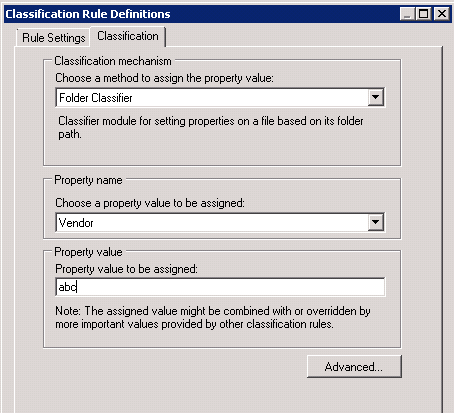 There, in Classification Properties tab page we created a String custom property Vendor. This is how Vendor property is defined in the property definition dialog which is similar to the SharePoint field definition screen. Then we define an FCI rule that instructs FCI to assign value abs to the Vendor field of all files in a certain folder. This is how the screen with rule definition looks like. Execute the rule – and all files in the selected folder become tagged with Vendor property with the assigned abc value. After this we can paste these files into a SharePoint list in MetaVis Migrator navigation tree. In our example we will map this Vendor field to the SharePoint library default Title field so that value abc that we assigned using FCI rule will be copied to Title field of the document uploaded into SharePoint library. We can specify values for other properties as well. Finally, here is our document in SharePoint library with Title field value copied from Vendor field which, in turn, was created and populated by File Classification Infrastructure engine. This article illustrates new MetaVis Migrator feature that allows to copy / paste or drag and drop files and folders from file system to SharePoint document library. Considering Windows Explorer graphical metaphor of MetaVis Migrator it makes importing files to SharePoint as close to usual file copy activities in Windows as it can get. This method however still utilizes powerful MetaVis Migrator functions like the ability to set content type, select or type field values and even preserve original file modification date or user while importing files from file system. Drag and drop or copy and paste files and folders from Windows Explorer window to SharePoint window will open the dialog to fill up some properties defined in the destination list. Select right content type, select values for fields and click Finish to copy files. Field controls will prompt for the values to select if they are configured in SharePoint. For example, this MK Region is a Managed Metadata field that points to term store with the list of countries in SharePoint. This is it. Al the files selected in Windows Explorer and dropped or pasted to MetaVis window will appear in SharePoint – having correct content type, with right metadata in right place. There are many articles about the usefulness of metadata in content management. More fields with values that are associated with a document or a page usually mean more relevant search, more flexible navigation and richer workflows. Here is a three part discussion about this subject. There are also tools and articles that help information architect to build better metadata models to improve the use of content management system even better. The issue with metadata emerges with the question: Who will type (or select) values for the fields for each piece of content we have? Content authors usually are the best candidates to put metadata values for the content they just authored but they are reluctant to do so. The other solution is to ask other people to tag content but these “other” people usually do not know the content that well to tag it appropriately. There is also a group of text analytics solutions that implement set of rules that read the text of a document or a page and deduct which fields should be populated with what values. In certain cases all these methods work really well, in some cases they produce unpredictable results and sometimes it is impossible to use them at all like in case of images that cannot be analyzed with text analytics algorithms. This article advocates another method that may serve well in certain cases. The method assigns values to many fields automatically based on the folder the content is dropped into. The task of the content author would be in this case to pick right folder to create a document and maybe define values for just a few fields after the content is produced. Other values will be populated automatically by SharePoint. SharePoint will get the values for the fields from the folder metadata. After this, folder navigation can be discarded by the use of list views but the content will retain field values assigned during content authoring. This method was used for years in some content management systems (OpenText Livelink comes in mind first). Also, this method is natively supported by SharePoint 2010. MetaVis Folders product enables this functionality for SharePoint 2007. To configure folder inheritance in MetaVis Folders for SharePoint information architect should create content types for both folders (for configuration) and items to keep field values. Then information architect should create folder trees in lists and assign certain field values for certain folders. After this, each document, page or item added to any folder will be automatically tagged with all field values collected from the folder this content was created in. This strategy allows to implement simple and efficient workflow in the organization that will produce highly structured tagged content with little effort from the content creators to tag it. MetaVis Migrator for SharePoint allows loading files from file system to SharePoint document libraries. It also allows to set document fields during the file load or to pick values for library fields from certain file properties like Modified Date, Owner or Keywords. The file load process also preserves folder structure in case the whole folder from file system is imported into SharePoint. Folder structure is one of the few ways to classify files on the file system. In SharePoint, however, it is preferable to maintain document properties in list fields. Using fields instead of folders in SharePoint libraries facilitates flexible content navigation, search and workflows. It is sometimes desirable to preserve folder information in certain fields of the document library at the time of the file import process. This approach works at its best in cases when files on file system are located in well structured folder hierarchies. The example of such folder tree is the following file path: N:\Network Share\Corporate Documents\Product Support\Company\Project\Phase\Document Name. In this example N:\Network Share\Corporate Documents is the documents storage location, Product Support is a company division, Company is the specific client, Project is the project and Phase is the project phase. MetaVis Migrator allows to grab any element of the folder tree (like Company or Project) and make it as a document field at the time of importing file. MetaVis Migrator allows to drag and drop (or copy and paste) files of folders from file system to SharePoint document library. This operation displays Properties screen that allows to select field for the imported documents. Select Content Type, define or map values for any fields on this screen. Pick a field that should contain folder information. Click Down-Arrow button for this field to map it to a property of the source files. The source properties will include folder values. In our example given above “Folder 1 in File Path” will have Network Share value, “Folder 2 in File Path” – Corporate Documents, “Folder 3 in File Path” – Product Support and so on. After field is mapped to the correct Folder and import process is started, MetaVis Migrator for each loaded file will set correct folder value for the mapped field. It is usually a good strategy to perform load of one file in MetaVis Data Analysis Mode to understand better the values for “Folder in File Path” properties. In this mode MetaVis Migrator will show values for the selected field on the source property pick up dialog. To enable this mode select menu item Edit / MetaVis Data Analysis Mode. Remember which “Folder in File Path” property should be used during mapping or save the complete mapping in MetaVis Copy Template. To save time, disable MetaVis Data Analysis Mode when performing actual file import and use MetaVis Copy Template or remembered “Folder in File Path” field during field mapping. There are two ways to copy files from file system and set some field values at the same time using MetaVis product suite. First way is to use MetaVis Classifier / Migrator or the whole MetaVis Architect Suite. If you use MetaVis Architect Suite switch to Classifier mode by pressing yellow tag in the application toolbar. MetaVis Architect Suite, Migrator or Classifier should be installed on the client computer. Execute Connect to SharePoint to load SharePoint WEB Site structure to MetaVis. It will show site tree, lists and folders in the Navigator View. Use My File System view to find folders on you file share that should be moved to SharePoint. Double click on the folder will display files located in this folder in Contents view. Select files and folders that should be copied to SharePoint in My File System or in Content view. Copy select files and paste them into SharePoint library folder or drag and drop selected files into the destination library or folder in the Navigator View. MetaVis will display “Copy Files” wizard that will allow to define field values for the uploaded files. Repeat this procedure for the other group of files that should be moved to the other destination. This way of coying files allows use of the MetaVis Core Properties Extension module that optionally might be installed on the SharePoint server. If this module is installed, it is possible to map created date, modified date, created by and modified by core document properties to the corresponding values of the file from the file system. The other way to copy files from file system to SharePoint libraries is to use MetaVis Folders product. MetaVis Folders should be installed and activated on the SharePoint server. After MetaVis Folders product is installed and activated, enable it for the libraries that will be destinations for the file system files. After this create folder-inherited content types in the site that will allow you to build folder hierarchy in the destination libraries with the certain values in the fields associated with folders. Add new folder content types into the destination libraries and build a folder tree there and assign values to the fields of the newly created folders. After this, copy files from your file shares to the destination folders using any way provided by SharePoint: upload files into the libraries using WEB GUI or connect to SharePoint library using Windows WEB Folders (Windows Explorer or Network Places). Any document that will be copied or uploaded to the folder managed by Metavis Folders product will be automatically assigned all field values from this folder (and its parent folder and parent of the parent folder, etc).